For a French cognac expert, Alexandre Gabriel has some interesting things to say about gin. Lately, gin producers have been getting very imaginative, shaking things up with brown (aged) gins, new flavor profiles and even gins that aren’t made from grains, like G’Vine, a grape-based gin. Take Gabriel, who started making Citadelle gin several years ago, taking advantage of cognac’s “off-season” from the end of March to sometime in November. Cognac Ferrand’s copper pot stills are cleaned and then used to distill gin, using the open-flame method required in making cognac, as opposed to steam-heated distillation. Starting in 2008, he began making an aged product, Citadelle Reserve, after discovering that 18th-century gins were inadvertently aged since the only way to get spirits from one place to another was in a barrel. “It was an ‘Aha’ moment,” he says. Aged gin is a trend that’s taken off with entries from producers large — Beefeater Burrough’s Reserve Barrel Finished Gin — and small, such as the limited-edition Dry Rye Reposado Gin from St. George Spirits in San Francisco. Gabriel has played around with different types of casks, including old cognac casks that have been rinsed with gin to keep the flavor from being overpowering, as well as American oak barrels and casks previously used to make Pineau de Charentes, a regional aperitif. Last year, Gabriel came up with yet another variation, creating Citadelle Gin Reserve Solera 2013, which is the first gin aged using the solera method traditionally used when making sherry or Madeira. Gabriel ages gin in different barrels and then blends all of the spirit in a “mother” solera vat to create a lasting taste profile (the solera vat will only ever be half-emptied). Gabriel isn’t the only Frenchman with a variation on English gin. G’Vine comes from EWG Spirits and Wine, also located in Cognac. Made by EWG proprietor, lead enologist and master distiller Jean Sebastien Robicquet, G’Vine’s first product, Floraison, was introduced to the U.S. market in 2007. G’Vine Floraison is made from ugni blanc (also known as trebbiano) grapes, which are traditionally used in cognac. A neutral grape spirit is produced and later blended with nine botanicals, including juniper and ginger and a concoction made from the green grape flower which blossoms briefly in mid-June. In the final step, the ingredients are blended and distilled again in a copper pot still. “The grape spirit has a sort of lushness and richness and roundness,” says Philip Duff, owner of the bar and beverage consulting firm Liquid Solutions, who has consulted with G’Vine. 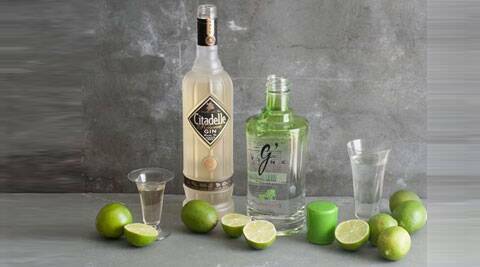 Other notable gins available include Monkey 47, made with 47 botanicals, and super-premium Nolet’s Reserve, which is distilled and bottled at the Nolet Distillery in Schiedam, Holland, and is the most expensive gin in the world at $700 a bottle. Nolet’s Reserve is made with two types of distillation and individually distilled botanicals including saffron, the world’s priciest spice, and verbena. Nolet’s Silver gin is a bit more affordable at $50. How are consumers reacting? Interest seems to be reviving in the category, says Brian Bowden, vice president of spirits, beer, beverages and tobacco at BevMo!, the West Coast-based chain. Aged gins, though, which range from pale amber to brown, can take a little explaining. “Everybody assumes that gin needs to be clear and then we have to explain the processes. At that point you have your consumer that always goes with their standard favorite and then you have the adventurous consumer who will pick it up just because it’s something new,” he says.